Food banks are increasingly talked about in the news these days and most people are aware that throughout the U.K. there are families struggling to put food on the table. However, if it were not for volunteers, food banks would not be able to run successfully. In the past year The Romsey Food Bank, based on the Romsey industrial estate have supported over 900 people with food and have had 11,000 kilos donated. Local telecommunications company ElemenTel based in Romsey, were keen to support their local food bank. 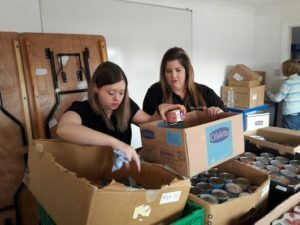 Therefore, for a day at the end of March, employees from ElemenTel gave up their morning to volunteer their time helping the regular volunteers undertake their annual stocktake. The staff from Elemental, worked hard to move large boxes from the storage room for them to be weighed and recorded. If you are a community group in need of help, this is just one way you could benefit by taking part in Community First’s Employee Volunteering Scheme.